Yes, I’m going to talk about light bulbs. This house is loaded with the cheapest bulbs on the planet. They all put off this yellow florescent light that gives me a headache. I don’t know about you, but I need light. Lots of light. If I don’t have enough light during the day I get depressed. And I hate being depressed. My mission is to replace the bulbs with brighter whiter light bulbs. I’m sure I should be buying the energy efficient ones that last like 25 years, but they aren’t white enough. And they take too long to light up. When I flip the switch I want instant gratification. I don’t want to wait 10 minutes for the light to get to its brightest capacity. 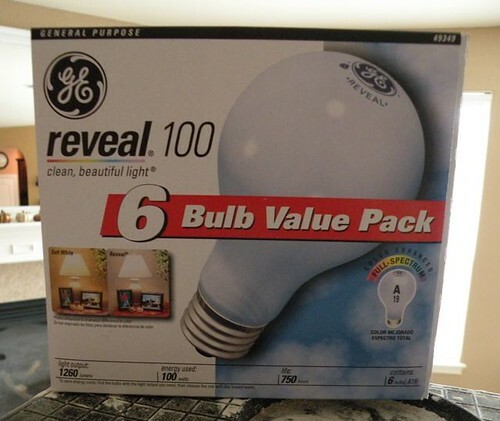 So I chose Reveal bulbs by GE. These bulbs really do put off a bright white light. They make me happy. It’s almost as good as standing outside in the real sun. One reason I love living in Texas is because it’s sunny and bright most of the year. We have an overcast day here and there, but for the most part it’s sunny. And the level of sunshine each day directly affects my mood. But I also don’t like to be outside in the elements all day, so I want the inside of my house bright and sunny too. As I’ve been swapping out bulbs, another thing that’s really helped to make the room brighter is to wash the glass shade around each fixture. Once they are washed I get all the spots off with my awesome Shaklee basic H cleaner (this stuff honest-to-God rocks). Look how much that glass sparkles now! 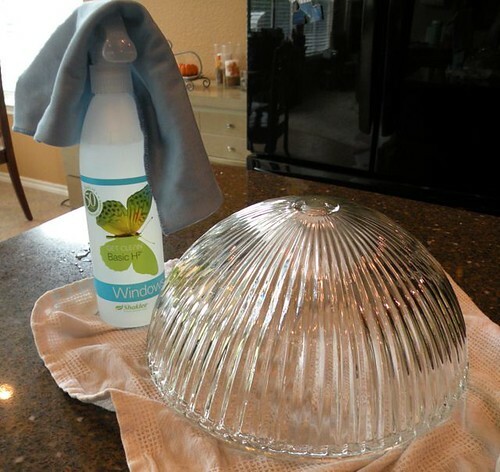 You should periodically remove your fixture covers and clean them to keep your house as bright as possible. I’ve been changing the bulbs in my house as they’ve gone out because these Reveal bulbs are pricey compared to the 6-packs at the dollar store. I’d love to change every bulb in my house right this very second, but it would cost me $230.11 plus tax. In just light bulbs. Can you believe that?! Grand total of $230.11 for all the light bulbs!! Needless to say, I can only afford a few a month, so I change them as the old ones burn out. They make the room 10 bazillion times brighter and whiter and I love them, but they are $7.97 each!!! Yikes! It wouldn’t be so bad if the builder of my home wasn’t canister happy. I have a grand total of NINETEEN canisters in my ceilings. There are 8 in my kitchen alone. I plan to swap a few of these out with other fixtures, but fixtures are on my bucket list as well. The funny thing is, there are four places in my house that need fixtures in the ceiling because there isn’t enough light in those areas. I’ve got 8 canisters in my kitchen and 3 in my stairwell, but none in the hallway or foyer? *I am not affiliated with or being compensated by GE to promote their Reveal bulbs. I simply love them and want to share them with you. *Shaklee is a sponsor of mine, but I also personally use the products and love them. I am the same exact way – I need light and brightness to feel happy. I was born and raised in Texas so it was given while I was growing up. We have have moved all over since being married and I have always bought the brightest white lights I could get for the house. Oh and I hate energy efficient light bulbs. They took too long to warm up which makes me never want to turn them off so I don’t have to wait for them. To that isn’t very energy efficient. LOL! I feel the same way about my light bulbs! I don’t know why other people can use “regular bulbs” and their houses look fine – but mine takes on this horrible yellowish hue. I only use REVEAL bulbs and the Phillips equivalent. DH thinks I’m crazy, but it changes the whole atmosphere in the house. I also feel the same way you do about the CFL’s. When I flip the switch, I want LIGHT – I don’t want to wait for it. And they are yellow too. Boy! I hear ya! I need light too. What a great idea to change out the bulbs with a brighter, whiter light!! I think I will begin changing mine out too!! Those energy saving bulbs drive me up a wall! They are so yellow and pale!! Sigh!! I LOVE the Reveal bulbs. I use them all over the house too. Same method, replacing as they burn out to save a little $$ along the way (what good are half-used bulbs anyway?). I’m jealous of all your light though – in our old house, that’s what we’re lacking most. I am so with you on this! I’ve tried to do the green thing and use compact fluorescent bulbs but they put off a horrid blue light. I spent WAY too much money on a newer style of CFLs that were supposed to have a more natural spectrum of light for the new 9-light chandelier we installed recently – and still hated them! I ended up swapping them all out for Reveal bulbs within 2 weeks. 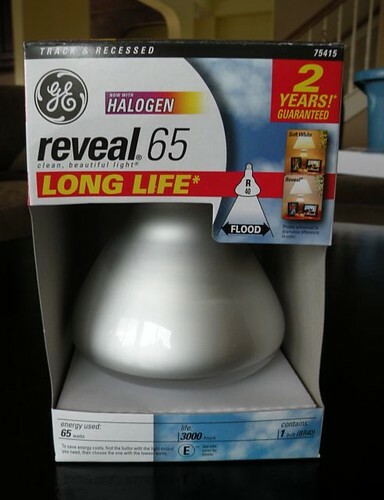 We have a few CFLs that we use in uplight cans that are hidden behind furniture (and so the light is well-diffused) but otherwise, we stick with GE Reveal bulbs! And I like LOTS of light, so we have lots of lamps. But I also have timers on most of them to help reduce the chance of them being left on by accident for an extended period. In fact, I found a nifty (and quite inexpensive) digital timer at Ace Hardware about a month ago that has TWO “cycles” so the lamp in our entry comes on in the mornings when I’m padding through to make coffee in the dark and again in the evenings when we shutting everything down for the night. I love, love, love that timer! I’m with you – – those bulbs that have to “warm up” to their full brightness drive me crazy!! DITTO! Better lightbulbs make such a difference! The other big issue I have with the coil bulbs is the disposal. We dont have a place to take the old or broken coils and they should never go into the regular rubbish. So while they may save $ on electric, I will spend twice as much on therapy and eye glasses! I recycle, upcycycle, use my own shopping bags, dont use plastic trash liners, compost, live in a passive solar home, plant; cut; and burn our own wood for heat. I draw the line at coil bulbs. I was stopping by to let you know that I am sharing the most stylish blog award with you. I love your blog! 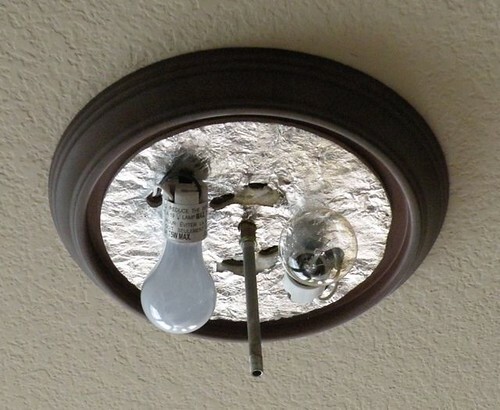 I know that Reveal makes a CFL now but haven’t tried it yet because the bulb is “huge” and wouldn’t fit my fixtures. Hopefully GE will start making some smaller ones. 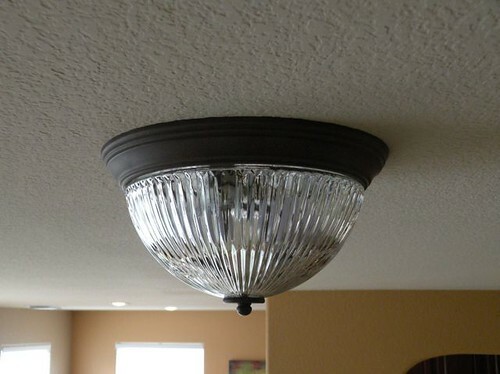 I have “bright white” or “daylight” CFL’s in my lamps, but regular Reveal in all the other fixtures. Only problem is they don’t last very long. The CFL in my lamp is going on 3 years old and that lamp is used 6 hours a day. I wish everyone would learn about lighting and the affect if has on your mood and your paint job. Ever hear people say “oh I just painted my room and I hate it” Most of the time it’s because they have bulbs that give off yellow light and makes their paint look like mud. One of my Reveal bulbs burned out in my pendant above my sink so I thought I’d try CFL temporarily. OMG, what that light did to my kitchen. I had to take it out immediately. Did you know that incandescent bulbs are being phased out? The last U.S. plant to produce them closed down this year. Our Congress decided that we MUST use CFL bulbs, and sometime in the next few years (I’m thinking 2014), the incandescent bulbs will no longer be available. Not only is the CFL light inappropriate for all home lighting (too harsh), but disposal is a major problem. And there are several pages of EPA instructions online to tell you how to dispose of a broken bulb. They have mercury in them. (Remember when we had to get rid of our mercury thermometers?) As far as I’m concerned, this is not acceptable. We must figure out a way to get this legislation changed! Agree with Lisa who commented above! I love my incandescents. I can’t stand the thought of living 24/7 in flourescent light by mandate of the government, ugh. So I am stockpiling! You are too funny! 🙂 I hate those “yellowy” lights, too. and yes, it’s a total pain, but ya gotta just take down the fixtures and wash them once in a while. .blechhhhh! I love those Reveal light bulbs too! I have been able to coupon and save on them! I think I’ve even gotten some for free (with coupons)! I have my little stockpile of those light bulbs ready to go when we’ll need them! 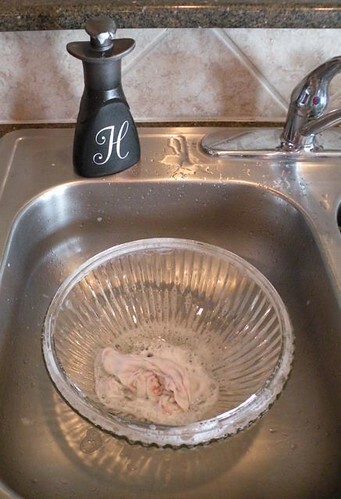 When we first moved into our house 2 years ago, I cleaned all of the glass light fixtures. It was like they hadn’t been cleaned in 5 years. I swear. It made SUCH a difference. And even though they all need to updated, at least they’re clean. 🙂 I clean them now about once per month. Glad you liked the chandelier! I searched high & low for months before I found one that was the right finish, scale, and with a price tag I could stomach. And those digital lamp timers are the best! Ace had a fairly generic-looking one for under $6 that I just stumbled across while looking for a small extension cord a few weeks ago. I wish I had bought a few since they’ve since sold out. As for the rel=”nofollow” in the link tag, I believe it is your blog’s comment entry form that inserted that because I didn’t. That tag tells Google not to spider links it finds while examining your site for updated content, which is actually something I’m not crazy about. I’m all about sharing the linky love and helping others get some Google juice too! I’m with you on the energy efficient bulbs being not white enough… but my fiance convinced me we need to switch anyway. It took me about a month, but now that I’m used to it (and ALL the lights are the same), it doesn’t bother me anymore! I thought it was me! But those dang lights do take too long to light up! Target has two GE light bulb coupons on their website right now! Just go to Target.com look at bottom under “Target Stores”, third subsection, choose coupons and then click the “household” tab. Looks great! I am glad that you love Basic H!!!! Just wait until 2020 when all bulbs will have to meet a 45 lumen per Watt efficiency mandate or be banned (in USA). Incandescent and halogen bulbs are not going to be able to meet this mandate. I am very particular about quality of light. I absolutely hate CFL. I have tried LEDs that claim to be the “same color temperature” as regular light bulbs, but they are actually an eery pink-purplish orange color that makes all the colors in my room seem dull, greyish, and just wierd. I have been doing some experimenting, and the best thing I have found so far is to combine both a halogen bulb and a cool white LED bulb behind the same light fixture. The light from this combination is better than even Reveal bulbs, in my opinion. It may look a little strange in the fixture, with two colors of light vissible, but the lighting in the room is just right. But as for just using an LED bulb by itself, I have tried all 3 different “color temperatures” and am just not happy with any of them – they have an annoying pinkish tint and make the colors in my room look greyish. I also am reluctant to use CFL bulbs because they give off UV radiation, and I have had skin sensitivity problems from them). I’m the opposite: I thrive in the gorgeous dark cold nights of winter! Light, the sun depresses me. I loathe summer and all it’s loud screaming people! This is from 2010: how do u like the stupid coil mercury-laden bulbs? Just put one my mgr gave me: it casts a YELLOW, camelpiss light! My beautiful WHITE skin! :-/ now I look jaundiced! I hope President Trump brings back normal, SAFE bulbs along with washing machine who actually RINSE WITH WATER and lots of it!